When you need fast, same day Rinnai hot water repairs or new installations, you can rely on the 24 hour service, expertise and professionalism you receive from Omega Plumbing. You can read more about your customer service level guarantee on this page here, and from our other delighted Sydney customers on this page here. It's why we're already the trusted choice in thousands of homes for their hot water needs. 1. 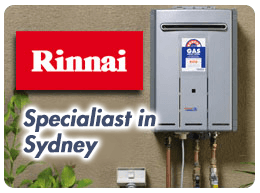 FAST RINNAI REPAIRS - ALL MODELS: If your existing water heater is experiencing an issue such as no hot water or a major leak, we can dispatch a repair team today. With teams at multiple locations across Sydney and tracked by GPS, we can send the nearest available team direct to your door open 7 days. And you can be so sure that we'll be there on-time that if we're late we'll pay you up to $100 ($5 off per minute up to $100 off, conditions apply). 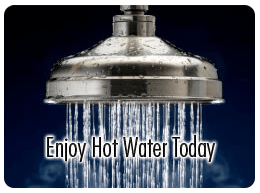 And with our 30 years of experience, we can repair all brands and models of water heater system. 2. 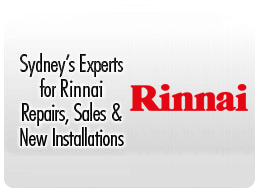 NEW RINNAI SYSTEMS: For the best choice in replacement Rinnai water heaters, Omega Plumbing can assist with a complete installation, including removal of your old water heater.